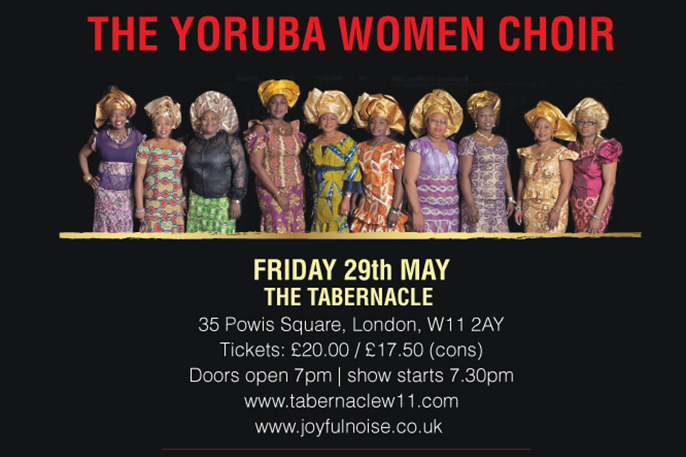 The Yoruba Women Choir and Femi Sofela to perform at the Tabernacle on Friday 29th May 2015. Nigeria’s the Yoruba Women Choir is one of the world’s greatest choirs. The soulful harmonies of the 10 singers and the infectious rhythms of the 7-piece band are combined to create an uplifting musical experience. Mixing secular and non-secular songs together to create joyful songs that lift your spirit and soothe your soul. The choir’s exquisite harmonies are as deep as the ocean and their performances have won many fans all over the world. They present their new international touring show Love Is The Answer which sees six soloists taking centre stage in a show bursting with energy. The Yoruba Women Choir are Funmi Olawumi (founder/leader), Ayinke Martins, Mary Tade, Dupe Lawnson, Esther Mabadeje, Joy Aigbekan, Nike Fagbuaro, Biola Dosumu, Tinu Adewoye, Biola Awolola, Kehinde Talabi. Their musicians are Niran Obasa (keyboards); Taiye Agbaje (guitar); Kayode Adeniran (bass); John Bello (drums); Wole Aina (conga); Wale Ogungbe(talking drums) and Imole Ayo (talking drums). Electric bass supremo Femi Sofela opens the show with his funky afrobeat quintet.